Thousands of marketers, agencies and businesses of all sizes across the world have chosen XGen. Why not join them and supercharge your link building and social marketing campaign? Why is XGen SEO so effective? "… an excellent marketing technique is to get involved in the community around your topic. Interact and contribute on forums and blogs. ..If you provide long-lasting, unique and influential content — something that lets your knowledge shine — people will want to recommend it to others.."
The key to link building success in 2012 is leveraging off the influence of social sites to build quality links to your website through article marketing. This is how article marketing works: Search engines trust social sites because content is created by human interaction. Users discuss topics that they are interested in with other users. The more submissions = more trustworthy your website to the search engines = higher ranking! If you submit your article to those social sites with links to your website and it is mentioned on the social site. This creates a "like" or "vote" for your website being trustworthy and reputable to the search engines. A "like" or "vote" is an important ranking signal for distinguishing quality websites. The search engines will almost always place more value over backlinks from social sites than static sites. What xGen SEO can do for you? Let us see what exactly the best SEO software tool for SEO on the market does to bring you the results that we talked about. XGen SEO will help you automatically create hundreds of accounts on 100+ Top Social Media and web 2.0 websites - at a click of a button! This is done, with CAPTCHA resolved automatically! XGen SEO verifies all those 100s of accounts created automatically! No need to open and click on all these verification emails. It helps you create your articles quickly. XGen SEO will retrieve high quality articles based on your target keywords and put them right in front of your fingers. 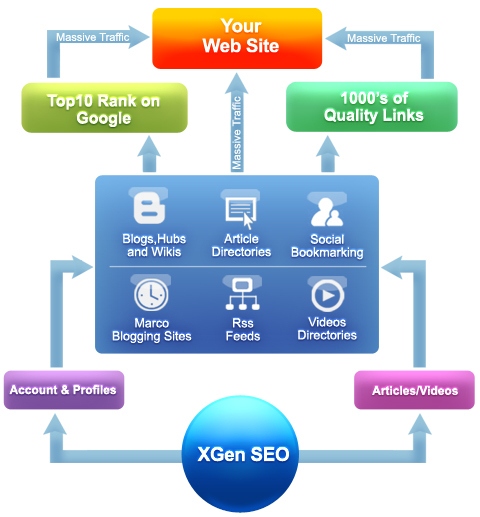 XGen SEO’s will automatically spin your articles into 10s of different versions! Now you don’t have to worry about duplicate content issues. It automatically submits 10s of versions of your articles to high PR article directories including EzineArticles, Article Dashboard, Article Trader, Article Cube, Article Rich, Article Base, ArticleAlley and Amazines. It then automatically submits different versions of your article to all the top blog sites, hubs & wikis including EasyJournal, BlogSpot, Zimbio, LiveJournal, WikiSpaces and Hubpages. It will automatically post links of your article to all major micro blogging & social networking sites such as Twitter, FriendFeed and Facebook. It then gathers all the RSS feeds from the social sites you submitted content to and submits all those feeds to RSS directories including Blo.gs, Feedbase.net, Feedboy, Feeds4all and Azfeeds. XGen SEO then automatically gathers all the links from the sites you posted content to and pings them all using pinging sites including Blo.gs, Feedburner, Blogstree and Feedster! The best part is you can run the above steps as many times as you like with a few clicks of buttons to explode backlinks to your websites. This is simply traffic building on pure steroids!